The results of an extensive new effort by the FOIA Project to annotate Freedom of Information Act lawsuits are beginning to show up on FOIAproject.org. 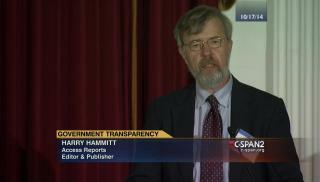 Harry Hammitt, a widely recognized expert on FOIA and the publisher of Access Reports, has joined the FOIA Project team. He has begun to tag cases by the specific issues involved and to add case and opinion summaries to the Project’s comprehensive collection of every court case in which a federal agency has been sued under FOIA since Oct. 1, 1996. That’s more than 27,000 court documents from more than 8,500 federal district and circuit FOIA court cases. Hammitt started with new district court filings and opinions, and is now working his way back in time to expand coverage to older cases. Before he could begin that work, an elaborate data-entry tool had to be built in order to capture Hammitt’s annotations. Hammitt, Dr. Susan Long of the Transactional Records Access Clearinghouse (TRAC), and TRAC’s Jeffrey Lamicela worked together to create the annotation categories. Then Lamicela, a computer scientist and principal architect of the FOIA Project, built the data-entry tool for Hammitt to utilize. Lamicela has now created the mechanism to add those annotations to the case detail pages that generate on the FOIA Project site when a case-title is clicked. In addition to Hammitt’s case summaries, opinion descriptions, and legal issue annotations, the case detail pages now also contain a full listing of docket events, which are updated daily. The FOIA Project is a nonpartisan, nonprofit effort to document and expose instances of improper withholding under FOIA. The Project seeks to create a climate that leads to full compliance with FOIA and ends the improper withholding of public records. It receives funding from the CS Fund/Warsh-Mott Legacy, OpentheGovernment.Org, The Peter and Carmen Lucia Buck Foundation, and others. FOIA Project is administered by TRAC, a joint research center of the Newhouse and Whitman Schools at Syracuse University.